Analysis: This sketch was a lot of fun. I think I really spent 30-40 minutes on this 15 minute sketch, because I wanted just a little bit more detail. The wrinkles on the nose and eye lids are so delicate to draw/shade, I needed to work with them a bit more to feel satisfied. His nose looks just slightly angled to the left, and the cheeks are a little thin compared to the size of his facial features, but that would be an easy fix. My favorite part is the brow line and forehead on the left. 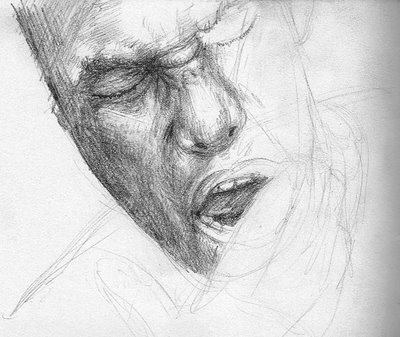 I'd like to get that level of spontaneity and rendering/shading throughout my entire sketch at some point. Sometimes I overwork things too much.